If France competed for the Triple Crown in van manufacturing, they would come up against the Germans and Italians, with Renault and PSA Group leading the field at present in sales terms. 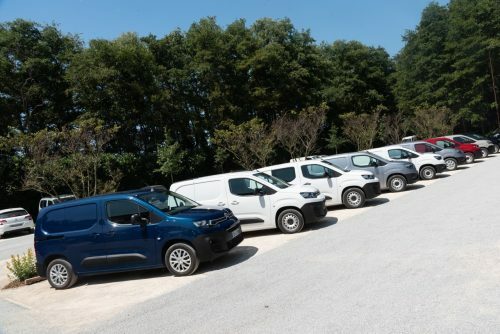 It looks like that mantle will continue to reign in the Gallic State as the PSA Group launches a fresh three pronged attack on the small panel van market. The PSA Group is enjoying a purple patch with demand for its light commercial vehicles at an all-time high. This is set to continue with the launch of the third generation Peugeot Partner and Citroën Berlingo, together with the fifth generation Opel/Vauxhall Combo – resulting from a pre-agreed collaboration with General Motors Europe before the PSA Group took it over last year. Ford leads the way in the medium van class with 20.7% while Volkswagen is No. 2 with 19.4% and PSA third on 18.4%. A 2% advantage over Fiat Professional (15.5%) and Ford (15%) sees PSA again take the No. 1 spot in the large van sector. When the Opel/Vauxhall van sales are added, the overall picture changes with PSA leading all segments – 25.6% overall, 37.7% in compact vans, 26.2% in medium vans and 20.3% in the large van market. PSA’a new LCV offensive with the introduction of a new compact van from the four brands now within the Group; Peugeot, Citroën, Opel and Vauxhall will be officially revealed to the world at the 2018 IAA CV Show in Hannover in September. It will offer improved versatility and useful capacities and above all, will be built to customer uses. Within the Europe 29 markets, the B-compact van market peaked at 489,478 units in 2016 with Partner, Berlingo and Combo taking 33% market share, claiming theNo. 1 and 3 positions respectively (with the Kangoo in the middle). For the new van (code named K9), panel van and crew cab versions are produced in long and short wheelbase forms. Gone is the platform chassis/cab type due to small demand. As Philippe mentioned, today’s commercial van customer needs are exceeded. Their basic needs are defined by (a) Capacity dimensions; (b) Cost efficiency, and (c) Robustness – while additional expectations caterfor cover versatility, convenience, passenger car like equipment levels and comfort. Different customer expectations were identified based on fleet size and vehicle use. From survey findings, worksite and utility operations run by small fleet owners make up the majority of compact van buyers. With this in mind, PSA has come up with two versions – worksite and on-road driver, with two trim levels – basic and standard offering specifications to match. For example worksite offers durability, robustness and off-road ability with a higher ground clearance and added traction control, while the road driver is more comfortable and safety conscious with an array of connectivity and driver assist systems.